Galbanum is the air-dried gum-like exudate from two closely related species of large umbellifers with yellow flowers, growing in Iran and Afghanistan. The sap is collected from cuts in stems and branches. 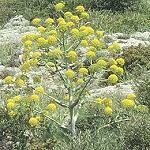 Since old ages galbanum has been used as an ingredient for making incense, providing a distinctive spicy note. By steam distillation of the gum, the so-called galbanum oil is obtained, highly valued in perfumery for its natural, 'green' character. 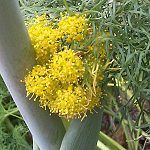 Galbanum oil has been thoroughly investigated. A few compounds in low concentration are responsible for the interesting odour characteristics, e.g. 1,3(E),5(Z)-undecatriene (galbanolene), having a unique, transparent, marine, somewhat green and metallic odour, and 2-sec-butyl-3-methoxypyrazine (galbanum pyrazine), having a powerful pea-pod odour and a very low odour detection threshold . Parfumes of the Chypre and Fougère-type often use a galbanum-like top-note, e.g. Vent Vert (Balmain 1945), Chanel No. 19 (Chanel 1970), Sport Scent (Jovan 1978) and Elements Aqua (Boss 1997). Several compounds have been developed with an odour resembling that of galbanolene but being easier to employ. One of them is allyl isoamyloxyacetate (allyl amyl glycolate), used in Drakkar Noir (Guy Laroche 1982), Cool Water (Davidoff 1988) and Egoïste Platinum (Chanel 1993) . Another one is Dynascone ® (Firmenich), an extremely powerful and diffusive odorant with an odour reminiscent of galbanum, with a pineapple and hyacinth character. 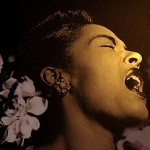 The famous American jazz singer Billie Holiday (1915-59) had gardenia as her beloved flower. She was inspired by its fragrance and often made her appearances with gardenias in her hair. The gardenia most commonly grown is a filled variety of G. jasminoides, originating in southern China. The flowers need a high humidity to develop properly. 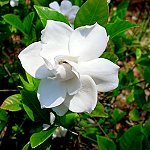 (E)-ocimene together with linalool, methyl benzoate and a number of tiglic acid esters are the major components of the gardenia flower headspace . A recent Japanese study determined the enatiomeric ratio of several volatiles from gardenia flowers. Jasmine lactone, gamma-decalactone and linalool was shown to be close to 100 % of the above chirality . Etymology: Gardenia has its name from the American botanist Alexander Garden. See also the Polynesian tiare. Garlic is native to the plains of western Asia. Its use in cooking is as old as humanity. The undamaged garlic is without odour, but on cutting or pressing it, strongly odoriferous and chemically reactive sulphur compounds are immediately generated. This mechanism protects the garlic against parasites and moulds, and is due to an enzymatic generation of allicin (diallyl disulphide sulphoxide) from the stable compound alliin (S-allyl-L-cystein sulphoxide). 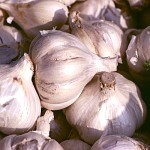 The odour of freshly cut garlic comes from allicin. Further reaction may result in additional powerful odorant like diallyl disulphide and vinyl-[4H]-dithiines . The enzyme alliinase is denatured by short heating, and therefore preserved garlic has a mild taste. Garlic's sulphur compounds are antibacterial and antioxidative, and their medicinal benefits are still being investigated. See also ramsons and onion. The main cultivation areas are Réunion and Madagascar (Bourbon type), Egypt (North African type), and China. The Bourbon oil is the most valuable. It has a very powerful, green, leafy-rosy odour with a pronounced fruity-minty undertone and a rich, long-lasting, sweet-rosy dryout. The amount of oil by steam distillation is as low as 0.15 %, but geraniums grow fast and the crop yield is substantial. cis-rose oxide (having an extremely diffusive, green-rosy, slightly metallic odour), (-)-isomenthone, furopelargone, and citronellyl diethyl amine (imparting a special floral odour with a slight quinoline-like undertone). The Bourbon type is characterized by high levels of (-)-6,9-guaiadiene . Geranium oil has wide applications - from soap perfumes, a famous example being the highly scented Spanish Maja soap (Myrurgia 1918), to luxury perfumes, Youth-Dew (Estée Lauder 1953), for example. Etymology: Gr. geranos, crane, and Gr. pelargos, stork, because of the shape of the seed capsules; Lat. graveolens, heavily odorous. La Réunion (Ile de Bourbon), a small island in the Indian Ocean 500 miles east of Madagascar. P.S. The very diminished gas chromatogram in the lower right picture shows the analytical "finger print" of Bourbon type geranium oil. The peak marked with a "g" represents (-)-6,9-guaiadiene. 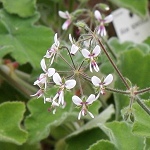 Multitudes of differently "scented geraniums" (pelargoniums) have been developed - and still are. 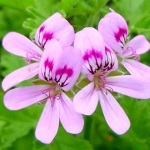 Pelargoniums are easily propagated from cuttings, and transgenic modification has been performed in tissue cultures using e.g. Agrobacterium mediators. 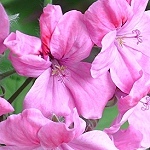 Scented geraniums are often displayed at gardening shows and enjoys much popularity. Odor classifications into rosy, minty, peppery, citrusy, camphoraceous, etc., are rather unprecise and new hybrids are presented all the time. Analytical work on the essential oils is modest. 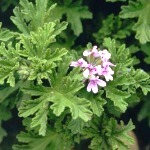 However, a scented geranium named Clorinda in my own possession (photo) might be mentioned here: On the slightest touch of its hairy stalks a powerful peppery odor is developed. Smelled on the skin this impression is succeeded by a more fruity dryout. 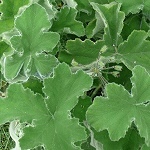 Lis-Balchin  mentions citronellic acid as a major compound of the peppery scented geraniums. Another study has b-guaiene and aromadendrene as major sesquiterpenes of P. 'Clorinda' . P. tomentosum, a native of the southwestern Cape Province in South Africa. Here it is confined to mountainous habitats where it thrives in semi-shaded, moist places and is usually found on the margins of ravine forest in sandy soil near streams. 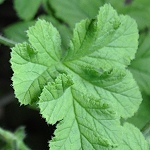 Its densely hairy leaves give off a strong and bright peppermint odor when touched. The main components of the steam distilled essential oil are (+)-menthone (25-27 %) and (-)-isomenthone (61-62 %) .